« Thank You Fans and Friends Sale! No not my hair, it’s there already. 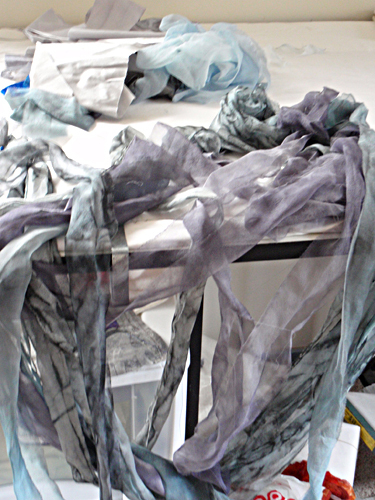 My new piece, tentatvely titled “You Are Here”, is predominently made of silk gauze dyed to various values of gray. There will be some saturated color at the end but right now my eyes are adjusting to sometimes very subtle variations in gray. I originally acid dyed a batch but have found I need more of the darker variety. So I have been Mickey Mouse overdyeing for days using old containers of black Setacolor and fabric paints. A messy business indoors. And it is HARD to come up with just the right nuance of gray!! It’s too greenish or purplish or bluish. Of course it all looks the same wet so I have to let it dry and then iron it to see the results. 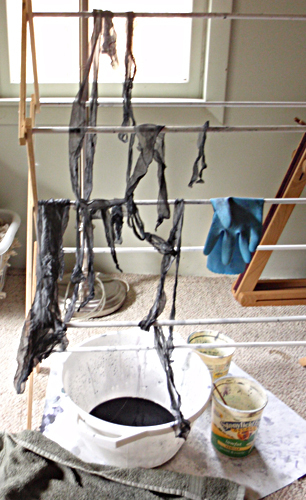 I tried drying still damp silk in the dryer…trust me, don’t do this. After 5 overdye attempts, I think I finally hit on a batch that hopefully will work! This entry was posted on November 15, 2011 at 10:26 am and is filed under Artwork, Dyeing, Process. You can follow any responses to this entry through the RSS 2.0 feed. You can leave a response, or trackback from your own site.